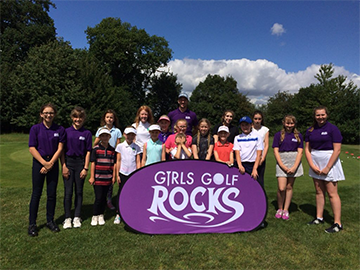 Girls Golf Rocks has inspired over 220 girls to start playing in Essex – and their numbers are set to grow even more this year. Working with England Golf and the Golf Foundation, we are hoping to attract more girl golfers and we’re back with eight free taster sessions this April, followed by coaching courses and Girls Golf Rocks on Tour – a series of playing days to encourage new girl golfers to get out on the course and make new friends. The newcomers at the taster sessions are supported by girl Ambassadors, whose encouragement for the newcomers helped to make the project such a success in 2017. For information or to book your place please call the host club. Girls only group coaching classes will start in April and May at each of the golf clubs hosting taster sessions, and there will be the opportunity to receive GGR coaching through to the October 2018 school half-term holiday. The classes will cost just £5 a week and will run for the school term. For girls signing up and completing a course, they get to keep a fitted 7-iron, to help them play and practise – so no need to buy any equipment up-front! Please contact the club directly for more information or book online here. Girls Golf Rocks on Tour is a series of playing days to encourage new girl golfers to get out on the course and make new friends. The playing days are open to all girl golfers across Essex, whether or not they’ve been involved with Girls Golf Rocks coaching, and they are designed to encourage beginners and improvers to play more often. The great value £15 entry fee includes a fun mix of coaching and playing the course, as well as lunch and prizes. Please click here for booking forms.